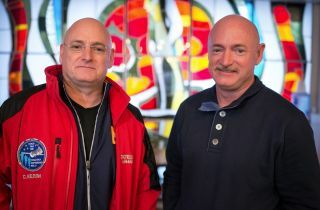 Identical twins Scott (left) and Mark Kelly pose for a photo at the Cosmonaut Hotel in Baikonur, Kazakhstan, on March 26, 2015, one day before Scott launched on a yearlong mission to the International Space Station. The only twins ever to fly in space are about to get a lot of love from their hometown. West Orange, New Jersey, will honor native sons Mark and Scott Kelly on Thursday (May 19), which the city has decreed Kelly Family Day. The former NASA astronauts, who are identical twins, will receive "Mayoral Medals," and the elementary school they attended — currently called Pleasantdale Elementary — will be renamed after them, West Orange officials said. Mark Kelly flew four space shuttle missions during his astronaut career: the STS-108 flight of Endeavour in 2001, the STS-121 mission of Discovery in 2006, the STS-124 flight of Discovery in 2008 and the STS-134 mission of Endeavour in 2011 (which was the second-to-last flight of the space shuttle program). He served as commander of both STS-124 and STS-134. Mark Kelly spent a total of 54 days in space before retiring from the astronaut corps in October 2011. He retired partly to help his wife, former Arizona congresswoman Gabrielle Giffords, recover from the injuries she suffered during a January 2011 assassination attempt. He is currently director of flight crew operations for World View Enterprises, an Arizona-based company that launches scientific payloads to the stratosphere using balloons, and that aims to loft paying customers soon as well. Scott Kelly flew on the STS-103 flight of the shuttle Discovery in 1999 and the STS-118 mission of Endeavour in 2007. He also stayed aboard the International Space Station (ISS) for long stints twice, from October 2010 through March 2011 and from March 2015 through March 2016. The one-year ISS mission, which Kelly conducted with cosmonaut Mikhail Kornienko, marked the longest stretch anyone had ever lived continuously aboard the ISS. The goal was to help pave the way for future crewed missions to Mars, which will require long journeys through deep space. Mark Kelly was part of the one-year mission as well, participating in experiments on the ground to provide a genetic control for Scott. Scott Kelly holds the American record for most total days spent in space, with 540. He retired on April 1 of this year. Both Kelly twins are former test pilots with the U.S. Navy. They are 52 years old. Editor's note: Space.com and its partner collectSPACE.com are media supporters of the Pleasantdale Elementary School renaming ceremony to honor the Kelly astronaut brothers.